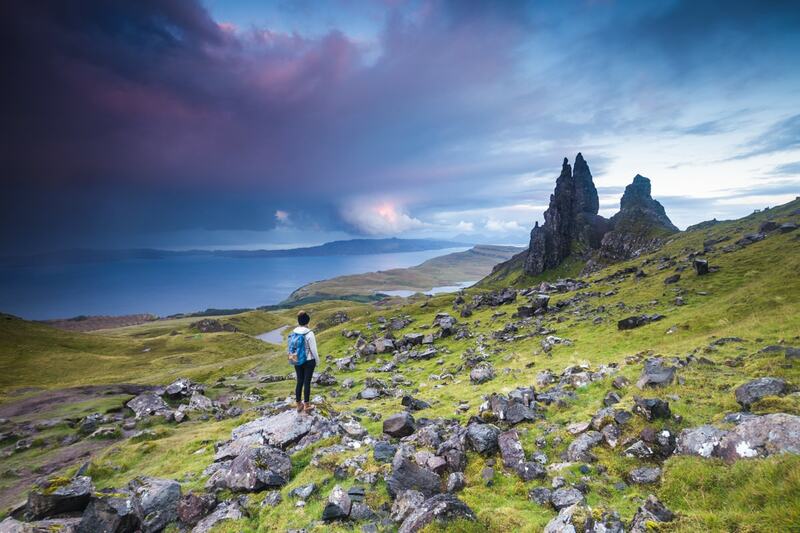 There are few places in travel photography hotter right now than the Isle of Skye. 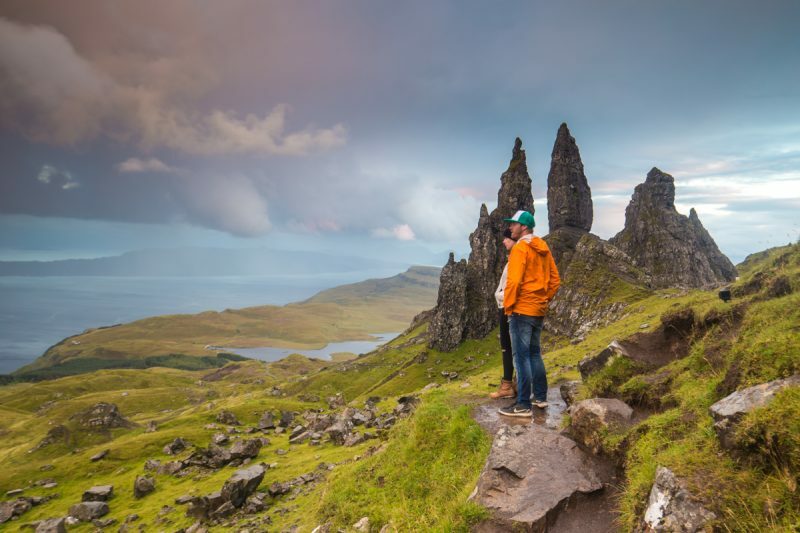 The Scottish Islands are popping with tourists as photographers have been reeling off beautiful images from some really cool locations recently. This past week, I headed up to the Highlands of Scotland for a little bit of a scouting missing for a future assignment. I only had limited time, but I was set on finding some of the best photography locations on the Isle of Skye. And, luckily, I found loads of them. These were my favourites. 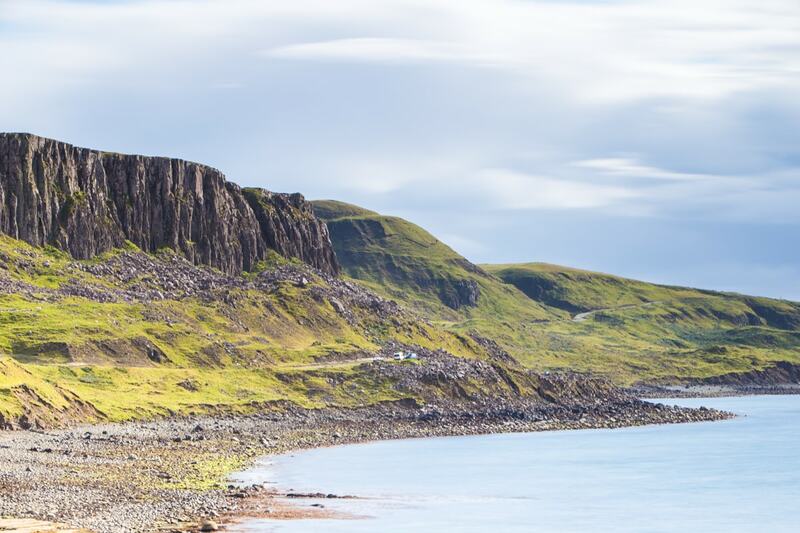 This is maybe the most iconic place on the whole of the Isle of Skye. It’s just a wonderful photography location. Landscape photographers will drool over the possibilities up here at the Old Man of Storr. Essentially, this location is a series of pillar rock formations that stick out over the island. A 30-40 minute hike gets you up to some perfect images. Note, though, that due to the geography of the location on the leeward side of some mountains, the weather can change quickly here. We shot this location at sunset and alternated between getting epic light and hammered by rain. Right after being hammered with rain. 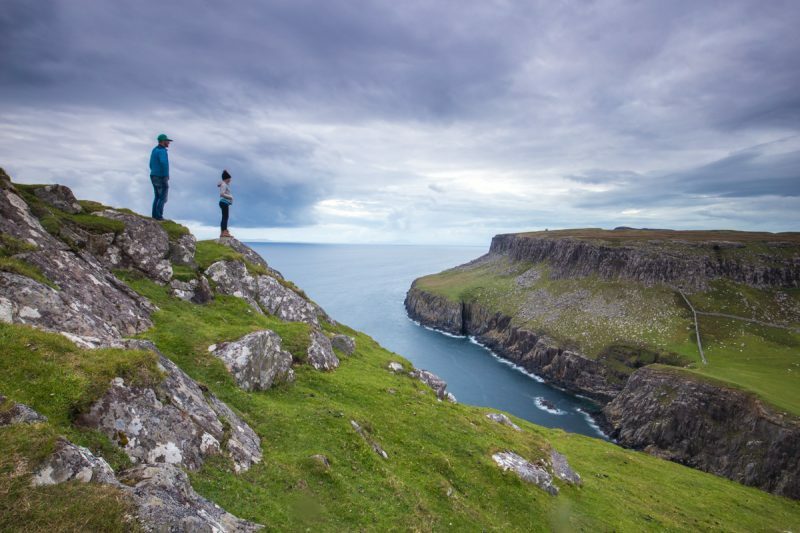 How to Get There: There’s a parking lot about 15 minutes drive north of Portree. It’s easy to find. From there, it’s a 30-40 minute hike to the view. I would guess it’s about 100-150m elevation gain. Parts of the hike are slippery, especially after rains. Best Time of Day: The location works for either sunrise or sunset. Gear: I shot my 16-35mm lens the whole time. You’ll also likely want a nice set of filters. I used these grad filters for my images. Honestly, I didn’t really give the Fairy Pools much notice in my plans. But, with so much extra time I thought they were probably worth checking out. I’m glad I did. Even though I didn’t photograph this location much, it’s cool. And, I think that much of the imagery online is pretty weak considering it’s such a cool spot. Like most of Scotland, we got hammered a bit by rain here, but still managed to take a photo. And, I didn’t even photograph my favourite composition of the falls. I think, though, I’ll come back here next time and shoot it at either sunrise or sunset. How to Get There: The Fairy Pools look well off a road according to most maps. But, a single track will get you right to the edge of them. The turn off is signed on the B8009 between Drynonch and Carbost. The falls are near Glenbrittle. There’s a parking lot there, and it’s a gentle walk down and up to the series of falls. Best Time of Day: The fairy pools get bust during the day, so come early in the morning or late afternoon. Gear: A mix of gear, likely. You’ll definitely want a wide angle though. And, like most falling water you’ll want an ND filter – at least 3 stops. This was my favourite location just because it had so much to offer. Sure, Old Man of Storr is iconic and maybe a better single image, but at Neist Point Lighthouse there are dozens of shots to be had. Honestly, I probably could have shot that locations for 2 days and not gotten bored. The classic image of Neist Point Lighthouse is actually from near the parking lot. Instead of going down the stairs, walk along the cliff edge to the right whilst looking towards the point. That’s the most typical location. However, I decided to head out onto the point itself and shoot from the highest spot. It might not be the most classic photography location, or even the best one, but it let me capture images in 3 different directions. All of these photos are all shot within 10m of each other. The lighthouse is only one of the many shots up here. Maybe my favourite shot from up here. How to Get There: Neist Point Lighthouse is on the westernmost point of Isle of Skye. It’s really well marked, and the GPS will get you there. It’s about an hour’s drive from Portree. Best Time of Day: Any time of day would work in some capacity. However, sunrise and sunset are going to be best. It’s pretty quiet there even at those times, so you don’t have to deal with crowds or selfie-makers. It is a really popular spot for wild campers and RVs though, so there will be people around. Gear: I shot both my 16-35mm and my 70-200mm. You’ll want ND filters to capture the dramatics of the sea and sky, too. And, a sturdy tripod is a must. It can get really windy here. This was a surprisingly cool photography location I had no idea about. We were just cruising around The Isle of Skye, and pulling over at certain parking lots. We came across this one, and didn’t really know what to expect. 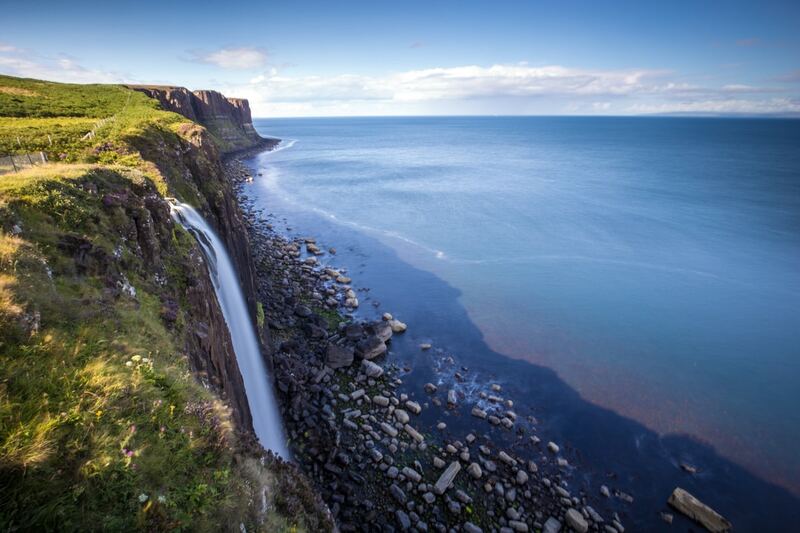 It turns out that Mealt Falls are these coastal waterfalls that dump right into the sea. I shot them during the day, and the light wasn’t good, and it was crowded, but it was cool. The spot to shoot images from is very small, so there’s not much you can do composition-wise. But, still very worth an image. How to Get There: The Falls are along the A855 north about 25 minutes from Portree. They are actually signed as Kilt Rock, which is another view point behind them. Best Time of Day: Check a sunlight directional map like Photo Pills to see which way the light is hitting the cliff. If it’s directly at the cliff during sunrise or sunset, that’s best. Since the falls are on the east side of the island, it’s likely best for sunrise. However, you’re so far north here that it could potentially also work at other times of day depending on the time of year. Gear: Definitely an ultra-wide angle lens. A Gorilla pod is also key so you can get up on the railing at the view point. For silky waterfalls, you’ll also want an ND filter if it’s bright. The castle on the northern point of Isle of Skye is more ruins than castle, but the views of the coast line up here are amazing. I shot a couple still in the day, and think that this would probably be a cool place to do some seascape photography down on the rocks and beach. I didn’t shoot here long, but I’m planning on coming back. How to Get There: Head north on A855. The castle is near the village of the same name and parking is available along the road. Best Time of Day: If you’re going to shoot seascapes, come at sunrise and the light will be hitting the cliffs in the right direction. But, this spot works any time of day. Gear: I shot my image with a 70-200mm. If you’re going to shoot seascapes, you’ll likely want something wider like a 16-35mm or a 24-70mm. Ok, I know it’s not on the Isle of Skye, but it’s close enough that I can include it on this list of locations. And, it’s such a cool location that it’s worth spending some time coming down to shoot it. 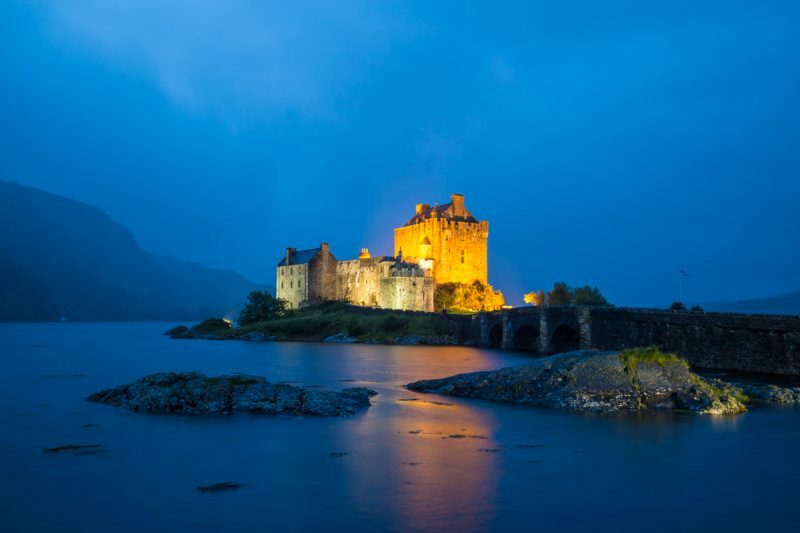 After photographing Edinburgh, and driving all day, we spent a night camping near Eilean Donan Castle before heading onto the Isle of Skye and I’m so glad we did. This was one of my favourite photo spots in the country, and even though we got rained on, I got some cool stills. 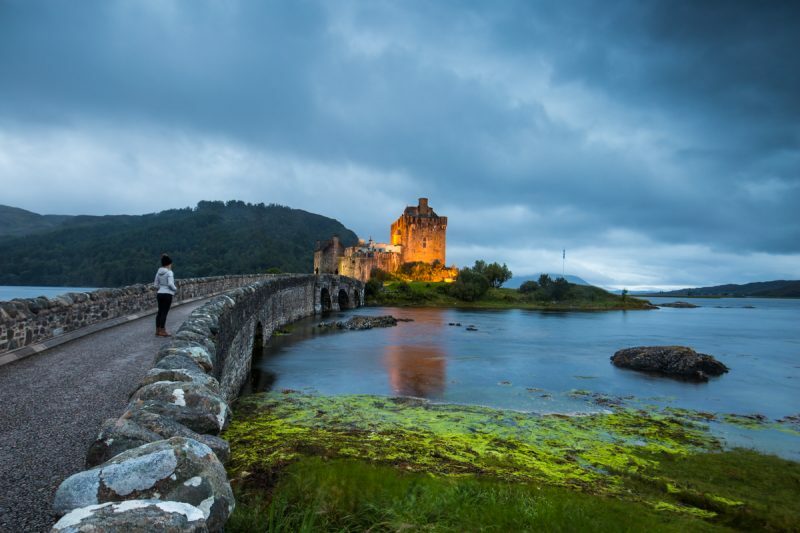 It’s one of the best photography locations in the whole of Scotland. @Alajode posing on the bridge to the castle. A tight crop of the castle in between spurts of rain. Blue hour at the castle. How to Get There: It’s right along the A87 near the town of Dornie. You can’t miss it on that stretch of road. Best Time of Day: I didn’t check it out for dawn to see if it was lit up, but at dusk it definitely was. I think, if lit at sunrise it photographs best during the blue hour – either dusk or dawn. Gear: I shot three different lenses here: 16-35mm, 70-200mm, and 50mm. I think you could probably get away with shooting just a standard zoom like a 24-70mm and nothing else. It was funny driving on the Isle of Skye. You always knew where the Highland Cows (Heiland Coos) were because there’d be no pull out, but a pile-up of cars stopped. 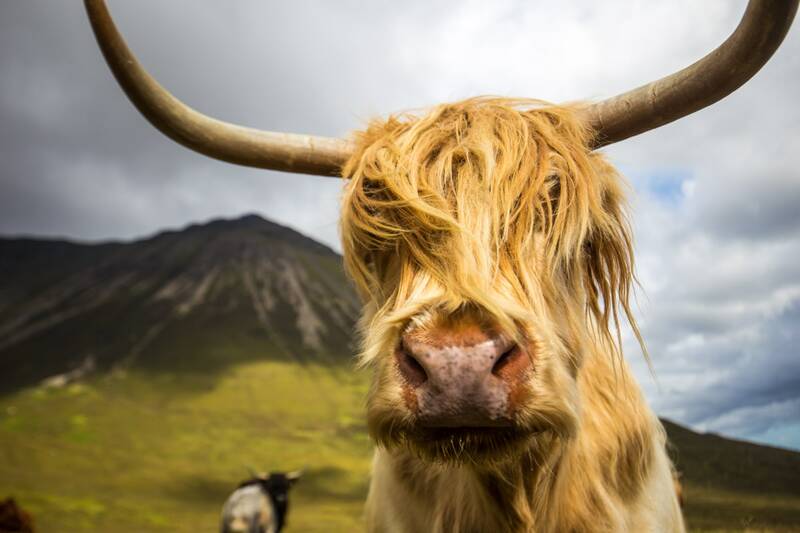 The cows are really friendly, photogenic, and a must-shoot on your Isle of Skye photography list. 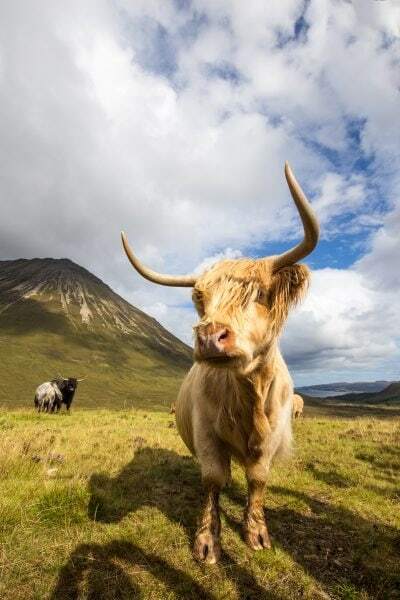 If you get lucky, like I did, you’ll even get the Highland Cows in front of some beautiful scenery. I couldn’t shoot everything, since I only had 2 days. But, these are a couple other locations that you could potentially shoot. And some of these locations I will shoot next time I’m on the island. I will update this list next time I come through the Isle of Skye with images from some of these spots. Portree Harbour: This is a really beautiful place to shoot, and right in town. Would work at sunrise or sunset. Dunvegan Castle: A bit of a pain to photograph since the grounds aren’t open at night. But, if you’re willing to shoot during the day, it’s cool. There’s a vlog that shows it below. Uig: I really thought Uig was cool. We stopped there for lunch one day. Especially at low-tide, there’s some really interesting colours to the seascapes. More? Any other locations? Let me know in the comments. I’ve got more photography posts coming. I did some location scouting in London as well as some shooting there too. So, there are a couple more UK posts coming up. I’ve also got one more post from Kyrgyzstan on the way. Did you see the last one about photography there? And, eventually, I’ll be making my way back to Canada for a couple weeks. Stay tuned for more adventures and photography. Nice post dear with awesome photography………. We have been there twice – beautiful, peaceful place. It has been a few years and I’m fuzzy on some details, but we have been to several of the locations you photographed, and they are all impressive. 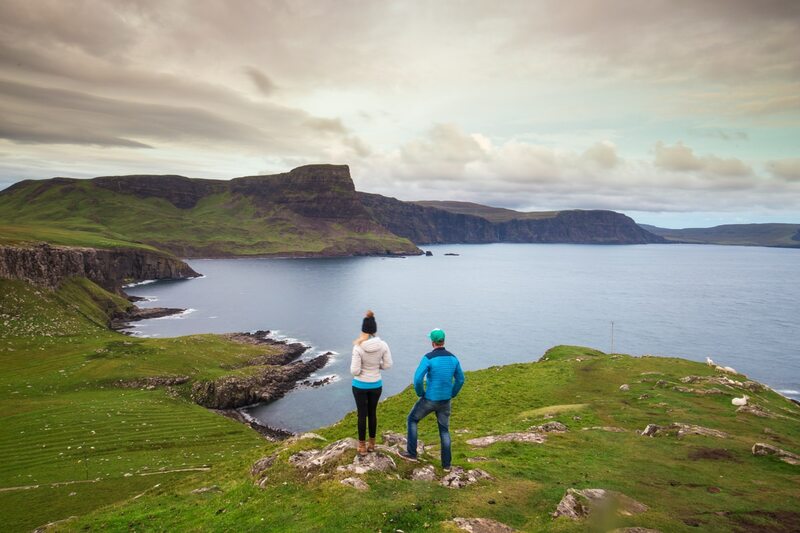 How about the hike on the northern tip that leads to the ocean and great views of the islands of the Inner Hebrides? Thanks for the article; I realize we have to return soon. Oh my gosh. 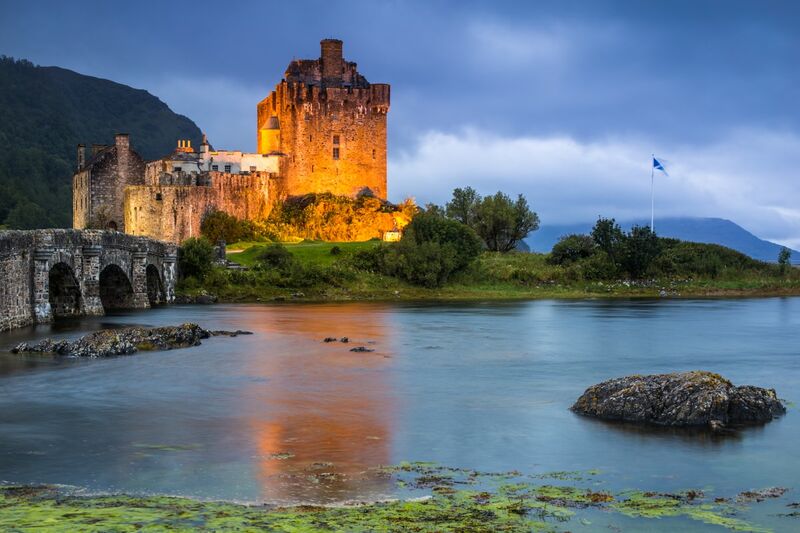 Amazing places in Scotland! 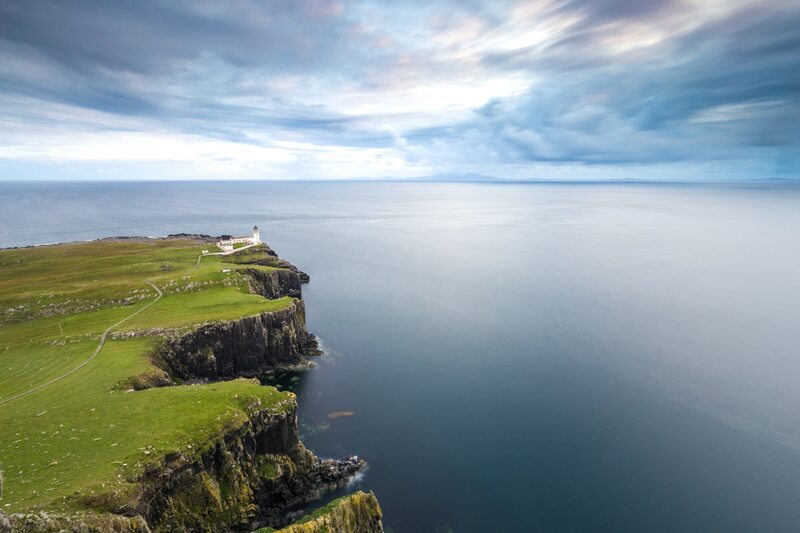 I’ll surely try my best to visit Neist Point Lighthouse during my next tour to Scotland. However, thanks for sharing such cool pics and infor. Oh, the Talisker distillery is on Skye too. Just saying. Mmmmm Whisky. I have no idea how I didn’t find time to drink whisky on this trip to Skye. haha. Some lovely images, Brendan, thank you for sharing. I guess the obvious location missing here is Elgol. Take the B8083 from Broadford and follow your nose! There’s a ruined church on the way, Cill Chroisd, which is worth a look and some other great views, is f the light is right. 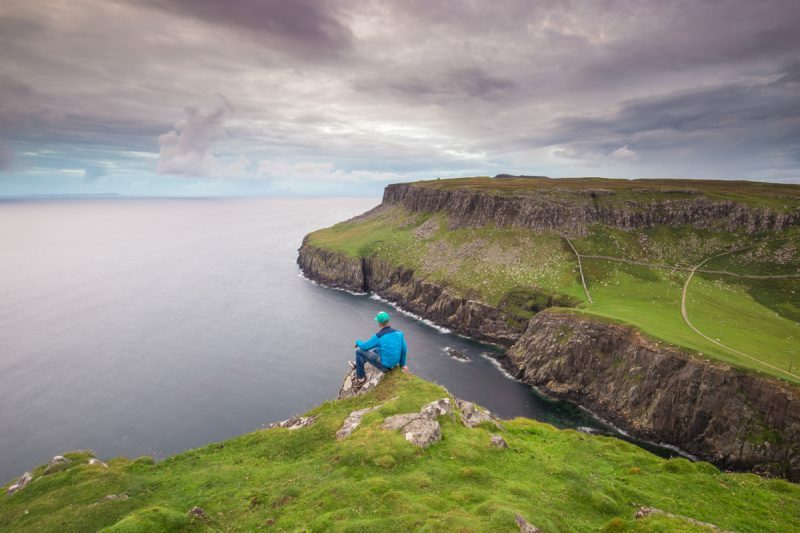 Other locations worth looking at, include the old bridge at Sligachan ( just called Slig by the locals) and if the tide is right, Talisker Bay has a lot of potential, with it’s waterfall and sea stacks. Of course, if you like your whisky, there’s the distillery nearby! That old bridge is awesome. Totally forgot it. But, man is it a crowded location! Will also add Elgol to my list to look up next time I’m around. Thanks! Sadly, the reality is that Skye is suffering from over exposure and dialling back on the shutter speed isn’t going to help. There are more tourists than the island can handle and typically, some of them spoil it for the rest by leaving rubbish everywhere and human waste beside footpaths etc. The island’s controlling council has even suggested a ‘tourist tax’ to help offset the costs of cleaning up. I have never been able to understand why people visit places of such natural beauty and then throw their rubbish on the ground. Try going later, or earlier in the year. The light is often much softer, there are fewer visitors and best of all, NO MIDGES! Totally agree on the over-visitation. I’m wondering if they should start limiting people on a per-month basis like Cinque Terre did. When I was there, I was impressed at how good people were with limiting their impact, though. Aside from a couple people that decided to build a fire on the grass near Storr, most people were respectful. But, yes, planning on going back off-season, for sure! Wow!!! What a lovely images. The clicks are really awesome. The places looks so beautiful and really it is the perfect location for photography. Thank you for sharing these wonderful pictures. It is really helpful. 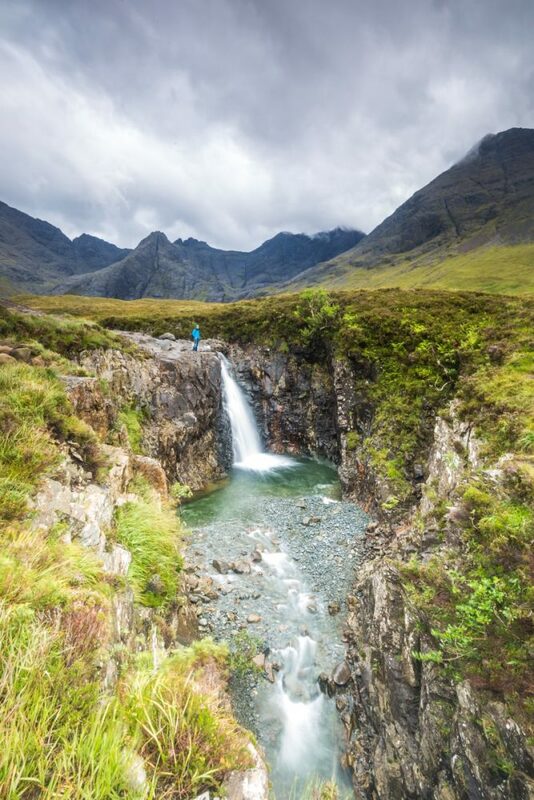 The Fairy Pools looks like a great location, good thing you decided to check it out. And of course, I liked the castles best, there’s something about Scottish castles that brings you back right to medieval times.